The biggest event in the World of Minibike racing takes place this weekend at Kieradan Park near Scunthorpe as it hosts the 2019 Minibike of Nations and Minibike World Championships. It’s all systems go for this weekend’s PITBIKE SPEEDWAY WORLD FINAL, and the series is pleased to announce as well as our main corporate sponsor this final round is being supported by their friends at Laurel’s by design, Red Circles Motorcycles and Rhino Goo bike cleaner. The track has been prepared perfectly by the Iwade track team, and the kudos of being the first 2019 Motorcycling World Champion hangs in the balance of a Titanic 5 way battle. 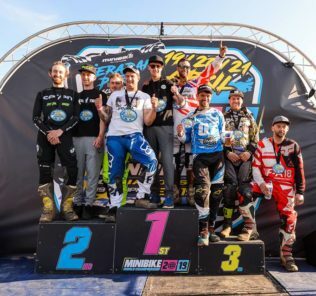 A bumper spring crowd spurred on by smokin hot weather, worthy causes and spectacular action were treated to 44 adrenaline filled Racing showdowns culminating in Epic PitBike Speedway World Championship finals and an A final that took 3 attempts to gain the finishing result. 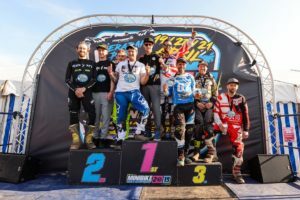 This Sunday, 24th February it’s the penultimate round of the Pitbike Speedway championships, and it’s now go time with those racers who have their eyes on the title. It’s mega tight at the top with no less than 9 riders having a realistic chance of standing on the top step of the podium after round 5.